The Niagara Falls PowerHawks capped off a weekend sweep of the Oswego Stampede with a 6-0 victory early Sunday morning. The night before, they were 4-3 winners in a thrilling overtime game. Due to scheduling changes, both games were held at Niagara University in the Dwyer Arena. Andrew Logar found his way to the scoresheet early in the contest with the first goal of the night. Coming at 5:21 of the first period, Anthony Arbatosky and Matthew Minichiello assisted on the tally. Oswego responded, on the powerplay at 11:35. Rich Hart was credited with the lone assist. Tommy Kilway gave Oswego the lead five minutes later, with Eddie Cannon assisting. They carried the 2-1 lead into the first intermission. The PowerHawks did not wait long to tie the game. Branden Tripi lit the lamp only 2:07 into the second period. Brandon Schweickert and Matthew MInichiello provided the assists. Minichiello scored his own marker to give Niagara Falls the lead again at 10:15. Schweickert and Gage Mueller assisted. Eddie Cannon tied it at 3-3 for Oswego at the halfway point of the third period. Kilway provided the assist. Niagara Falls started the overtime period a man short as Schweickert sat in the box. However, Josh Mitchell kept the in the game. Matthew Minichiello finally found the back of the net as time ran down to six seconds left in the extra frame. Logar assisted on the winning goal. Josh Mitchell turned away 30 of 33 shots faced in the win for the PowerHawks. Steven Kozikoski made 51 saves on 55 shots for the Stampede. It was a very early faceoff Sunday morning at Dwyer Arena for both teams, although Niagara Falls showed no break in their steps after a short night. It took most of the first period before anyone was able to break the goose egg on the scoreboard. Brandon Snyder opened the scoring with a goal at 17:25 of the first. Anthony Tomassi and Andrew Logar assisted. Niagara Falls stretched the lead to 2-0 when Stephen Minichiello found the back of the net. His brother, Matthew, assisted. Brandon Schweickert added to the lead in the second period. Branden Tripi provided the assist on the powerplay goal, coming at 12:23. Stephen Minichiello scored the PowerHawks’ fourth goal with only 56 seconds left in the period. Frankie Bodami and Matthew Minichiello were credited with the assists. Niagara Falls scored another pair of goals in the third period. Frankie Bodami made it 5-0 at 4:29. Josh Kalinowsi assisted. Schweickert closed out the scoring for the morning with a goal at 15:45. The Minichiello brothers added to their season totals by both assisting on the marker. Kris Augustine turned away all 25 shots faced in the shutout for the PowerHawks. Ben White stopped 43 of 49 shots for the Stampede. These same two teams will play each other again next weekend on Saturday and Sunday. This time the PowerHawks will be visiting the Stampede at the Anthony J. Crisafulli Rink in Oswego. Game times are set for 7:30 on Saturday and 1pm on Sunday. 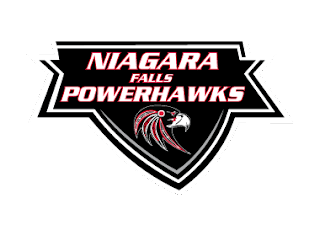 The Niagara Falls PowerHawks will be back home at the Hyde Park Ice Pavilion on February 2nd for a game against the Roc City Royals. They will continue that weekend on the 3rd and 4th at home against the Skylands Kings. There are eight home games left on the schedule.